If you’re on this site, the chances are pretty high that you recognize the name Peter Cullen. For the uninitiated few who do not, it’s safe to say that even if you don’t recognize the name, you’d recognize the voice. Cullen has been voicing iconic characters in hit TV shows, films, and video games for over three decades. His resume reads like a greatest hits list and includes classic shows like Scooby Doo, Winnie The Pooh, and Tom and Jerry as well as Eighties classics like Dungeons and Dragons, The Gummi Bears, GI Joe, and Duck Tales. Before this list continues for several pages, it’s safe to say that he is one of the key voices for many people’s childhoods. Cullen is most well known however as the voice of Autobot leader Optimus Prime in the original G1 Transformers series, as well as several video games, other series, and the Michael Bay films. At Comic Con 2012, following a panel moderated by Larry King, Cullen sat down with about ten journalists for an informative, enlightening, and humble talk about his career and in particular his role as the iconic Autobot leader. 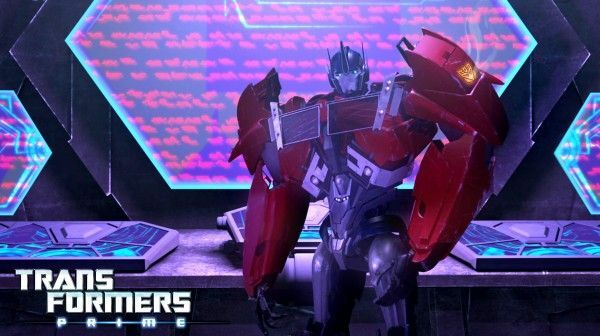 He talked at length about the past, the present series Transformers Prime, and why he feels so strongly about what cartoons can mean to children. Transformers Prime Executive Producer Jeff Kline joined Cullen. Kline declined to comment on any real spoilers for the season, in particular the supposed demise of a major character. Read on after the jump. It should come as no surprise that all the journalists in the room were extremely excited about the chance to meet Cullen. What was surprising however was when Cullen asked that each journalist also introduce themselves. It was no small gesture, and when Cullen made eye contact with each reporter in the room, you could feel eight-year-old versions of grown women and men smiling from ear to ear. Kline began the discussion by talking about how fiercely protective of the character of Optimus Prime Cullen has become. Kline stated that with Prime and Cullen come, “certain rules and expectations.” When asked if Cullen gives Kline notes, Kline asked if saying, “No” counted. Cullen Quipped that he was, “Sounding like a dictator,” to great laughter. Cullen was clear to state that there was a give and take to the dynamic and that there existed a great amount of trust. When asked if he was upset about Prime’s transformation back into Orion Pax and a Decepticon, Cullen shook his head. When Kline asked if Cullen trusted him, Cullen himself was quick to smile and say, “With good reason.” Watching the back and forth, it was easy to get a good sense of the working rapport the two have built up while working on Transformers Prime and Rescue Bots. Next Cullen explained that the character of Prime is based upon his brother Larry Cullen. Larry served as an officer in the marines, was decorated for valor several times and according to Cullen was his “hero.” In describing his brother Larry, Cullen stated he was the most, “honest, gentle, understanding, strong” person Cullen had ever known. Though Cullen admitted he’d told the story many times before, he still seemed to take great joy in sharing an anecdote about the day he went in to first audition for the role that would become his signature. According to Cullen the exchange went thusly. Larry: Peter, where are you going? Peter: I’m going to audition for a truck. Larry: What a way to make a living. Peter: Yeah, but Larry, he’s a hero. Larry: Interesting. Well, Peter, be a real hero. Don’t be one of those, you know, Hollywood prototypes. Be strong enough to be gentle. Don’t be yelling and screaming all the time. That’s my advice Peter. Take it or leave it. Cullen segued into speaking about the process of recording Transformers Prime, which is done “Radio Play Style.” Cullen heaped praise upon his cast mates. At one point Cullen stated, “I’m nowhere near as good as the people I work with.” Cullen later added that he loves any chance to work with cast mate Frank Welker. Cullen admitted that the finished product still impresses, even when he sits down and watches the show with his Grandson who sometimes seems to be more interested in characters other than Optimus Prime, much to Cullen’s chagrin. When asked about how he deals with children who may only know him as the voice of a cartoon, Cullen admitted that he used to worry about destroying the illusion in their minds by addressing them in character as Optimus Prime. Nowadays Cullen said he takes much more glee in becoming Prime for them. Cullen then dropped his famous phrase, “Transform and Roll out.” Again several grown men and women in the room were transported back to their childhoods, or at least this reporter was. When speaking about his fan interactions, Cullen was very appreciative of his first Botcon which Cullen called, “An eye opening experience” that he was, “at first hesitant to go to.” The questions, sincerity, and enthusiasm Cullen experienced still seem to shock him. Later Cullen spoke glowingly of his love for the fan base. “What we have is very special,” he said sincerely. Cullen also stated he enjoys being a part of the Transformers video game franchise, especially the interactivity it allows. Cullen takes his role as a, “latch key father to a lot of kids,” very seriously. Stating that he wanted to be the best influence he can be, Cullen spoke about his work with Hasbro, the Hub, and NASA. When Cullen spoke about how he wanted to do something that would, “benefit mankind,” a phrase that from anyone else might seem cheesy, it was impossible to not be swept up in his words. Both Kline and Cullen then briefly touched on Rescue Bots as well, and how it grew out of a desire to have a Transformers show for a younger audience. The interview closed with Cullen heaping praise upon his collaborators at the Hub and Hasbro. “Hasbro is a family, and the Hub is a family. I mean it,” Cullen stated matter-of-factly. Cullen feels that the companies share his desire to be a positive influence and believe in more than just, “making money.” As the interview concluded, and we all shook hands with a man many of us had idolized for years, it was hard to doubt his sincerity. You can watch Transformers Prime at Saturdays at 3pm ET/noon PT on the Hub. To catch up on all of our Comic-Con 2012 coverage, click here.